The text is written on a folio containing three other texts, with ‘Þu þad madist alle þinc’ the second of the four. The first and third of these texts are in Latin; the second and fourth are English, and are loose translations of the Latin texts. Thus, ‘Þu þad madist alle þinc’ is an English version of the preceding ‘Aspice mitissime conditor’ (‘Behold, most kind creator’). The two Latin texts are marked by both a capital ‘B’ and a hand in red ink pointing to the first line, while the two translations are preceded by simply a paragraph marker in red ink. The hands are likely memory-aids. Red also appears on the inside of capitals at the beginning of lines which had the necessary space. 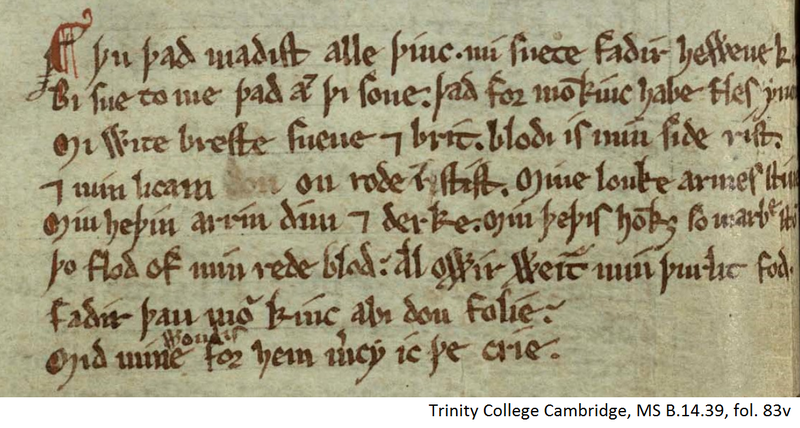 The text of ‘þu þad madist alle þinc’ contains several alterations: in line 4, between ‘licam’ and ‘on’, three letters have been erased, of which two, ‘on’, are legible. This is most likely the result of a misspelling. Similarly in line 4, between ‘rode’ and ‘stist’, a letter that is most likely an ‘i’ has been written over an erased letter that has become illegible. In line 8, the word ‘wondis’ is added in superscript. This might have been the result of the scribe having forgotten to insert the word. The punctuation in this text is restricted to the punctus—which here functions as a period—and two cases of the punctus elevatus (in lines 6 and 7), which indicate a longer pause. Capitalization is only used at the beginning of the line, with two exceptions in line 4 and 5. There, both occurrences of the ‘m’ at the beginning of the sentence are capitalised. This is a marked difference from the ‘m’ at the start of line 1, which is not capitalised. The text also contains several abbreviations: firstly, the Tironian et which stands for ‘and’ is used in lines 3,4, and 5. In line 2, an abbreviation mark which resembles the Tironian et occurs behind an ‘a’, but the context of the sentence demands it to be an ‘m’, so the mark might be understood as a macron instead. Several other macrons that indicate a nasalized sound occur in line 2, to supply the ‘n’ for ‘monkinc’; in line 5 in ‘ho(n)kiƷ’, and in line 6 in ‘wei(n)t’. The third kind of abbreviation used occurs in line 8. Here the abbreviation mark vaguely resembles an ‘s’, and it can be understood to stand in for the ‘er’ in ‘mercy.’ A last note is that several words at the end of lines 1,2, and 5, cannot be read due to the way the manuscript is positioned in the image. In ‘þu þad madist alle þinc’, the speaker is Jesus on the cross, who addresses God. He asks God to look upon His son, and Jesus describes His body and injuries in vivid detail: His ‘blodi’ side, ‘dim and derke’ eyes, and thighs ‘like marble’. The lyric ends with Christ pleading with His father for mercy on mankind. The genre of the text is a religious lyric, as it is a short verse with a first-person speaker that describes a single scene. It has (when some words that are missing from the scanned manuscript are added), a simple rhyme scheme of AABBCCCDDDEEFF, divided into stanzas of two and three lines. Secondly, the subject is quite overtly religious, as the speaker and addressee are Jesus and God, and the subject is the salvation of mankind. The manuscript that contains this text consists mostly of texts of a religious nature. This would suggest that the people who made use of this text were most likely members of the clergy, or at least people with an interest in contemplative texts. The Latin source text located above ‘þu þad madist alle þinc’ is, according to Rita Copeland,‘aimed at educated contemplatives. However, lyrics were generally intended to be sung, and the translation to the vernacular and the end rhyme make this text ideally suited for that purpose. This would suggest additional appeal to a wider audience than merely the educated clergy, such as people who had an interest in this sort of contemplative text, but were unable to read either the Latin original or the English translation. This wider audience might then have listened to the lyric instead of reading it. ‘Þu þad madist alle þinc’ is a text about the crucifixion of Christ, who is speaking to God and describing his traumatised body on the cross. It is a meditative text and the voice of Christ, and his monologue with God, is a very important characteristic of this text. Similar to this lyric is the early thirteenth-century poem ‘Now goþ þe sonne vnder þe wode’. This latter lyric has an important voice: Mary’s grieving speech. Like the poem edited here, this poem is also meditative in nature and located at the crucifixion. ‘Stond Wel, Moder, Under Rode’ is another poem about the crucifixion of Christ. This thirteenth-century poem contains a dialogue between Mary and Christ while Christ is hanging upon the cross. Christ tries to comfort Mary and explain the necessity of his death, while she can only see his pain. The dialect of the text has been localized to central Herefordshire. One characteristic of the Midland dialects in general in this period is the use of plural pronouns: they, hir, hem. The West-Midland dialect in particular kept the Old English rounded vowels /y:/ (like ‘y-stist’ and ‘y-nomen’) and /ø:/, while in the East they had been unrounded to /i:/ and /e:/ respectively. •Thau – seems an unusual spelling of thou. • Past-participle prefixes derived from Old English: i-, y- and bi- were used a few times. For example: bisue and y-stist. •Ho(n)kȝ – this last letter has a very unusual shape and might be a yogh but could instead be a S.
The text does not seem to have many significantly irregular word endings. A few spellings seem to be particular for the Herefordshire dialect, like kinc and fadir. The verbs ending in –ist are characteristic of the West-Midlands dialect area. Used with kind permission of the Master and Fellows of Trinity College Cambridge. Mi wite breste suene and brit. blodi is min side rist. Þo flod of min rede blod; all owir wei(n)t min þurlit fod.